Making homemade cleaning products has been a trend for a few years now, but did you know that you can make your own homemade bleach? 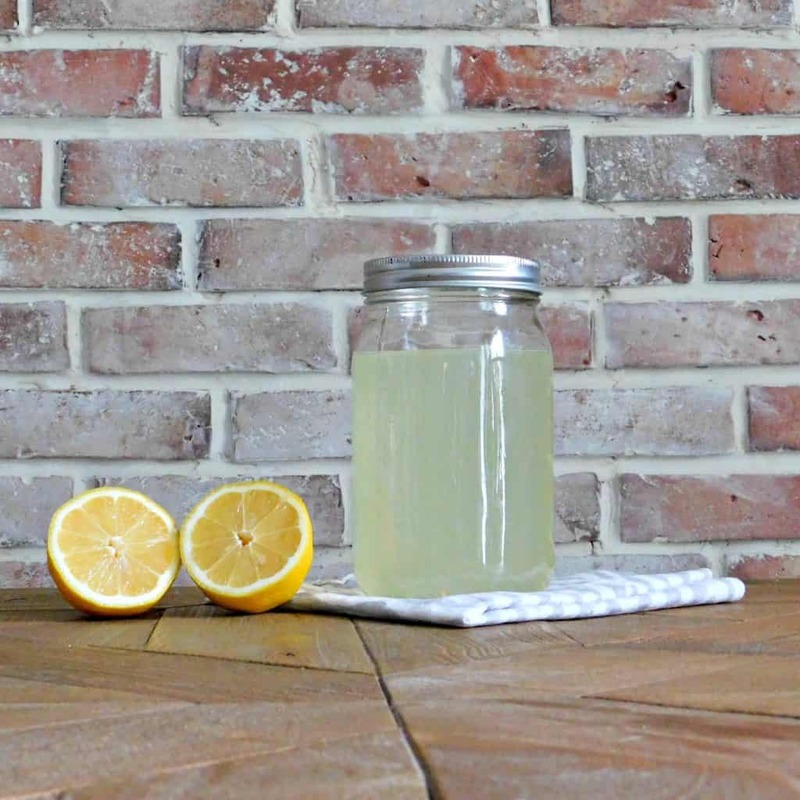 This is one of my favorite all natural homemade cleaning recipes. 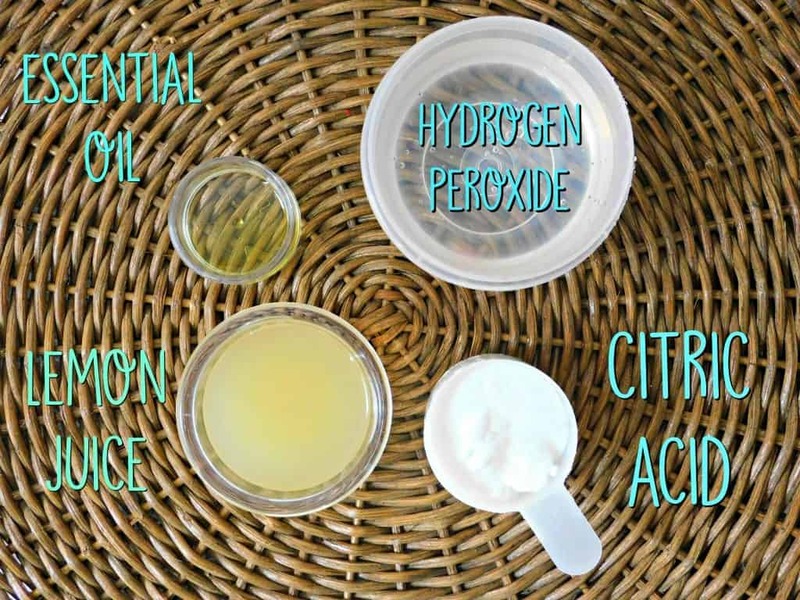 If you are making the switch to a non-toxic, chemical free home you will definitely want to try this homemade bleach alternative recipe. With just a few simple ingredients from your pantry you can make homemade bleach that will brighten your whites and disinfect germs without toxic fumes or skin irritation. This recipe is also seriously economical with a half gallon only costing 84 cents. Spring is officially here and I always get the urge to do some spring cleaning this time of year. Like many of you I like to make some of my own cleaning supplies. Not only is it economical but it’s also better for the environment and the health of our families and pets. I’ve come to the conclusion that you can make pretty much anything you can buy from the store. This is especially true with cleaning products. In the past I have shared my recipes for laundry detergent and dishwasher detergent, today I’m going to share my recipe for non-toxic homemade bleach. We usually have a jug of bleach under the kitchen sink or in the laundry room at all times. Truthfully I don’t really like to use it. Not only is chlorine bleach a super harsh chemical but the fumes really bother me too. I wrote a blog post about how to reverse tie dye with bleach a couple of years ago, so yes, I do use bleach occasionally and it comes handy for some craft projects, but when it comes to daily cleaning I prefer my own homemade version better. I like to reserve chlorine bleach for those times when I have nasty pet messes to clean up or our family comes down with a bout of the stomach flu. Chlorine bleach is sodium hypochlorite, a solution of chlorine and diluted sodium hydroxide. When exposed to the air, the chlorine evaporates as a gas from the bleach solution at a high rate, this is what causes strong smell associated with chlorine bleach. Bleach is nasty stuff. It stinks and the fumes are not safe for people or animals to breathe in. Chlorine fumes can cause everything from mild headaches and dizziness to internal tissue damage of the nasal, pulmonary, and bronchial tissues, if the exposure is either severe or prolonged. Sodium hydroxide is highly corrosive, and even though it has changed states here due to the chemical reaction with water and chlorine, the mixture is still corrosive. Despite the health and safety concerns, chlorine bleach is relatively shelf-stable and has been widely tested and approved as effective against multiple viruses, microbes, bacteria, protozoa, and other pathogens on both hard and porous surfaces, as well as an effective whitening agent. Always remember, never mix chlorine bleach with other cleaning products. For example when vinegar is mixed with bleach it creates toxic chlorine gas. Adding any weak acid to bleach ( vinegar, lemon juice etc) will release toxic chlorine and chloramine vapors. Ready to ditch the Clorox and try making your own homemade bleach? Pour peroxide, lemon juice, citric acid (if using), and lemon essential oil into a blue or amber glass bottle. Swish around until citric acid is dissolved. 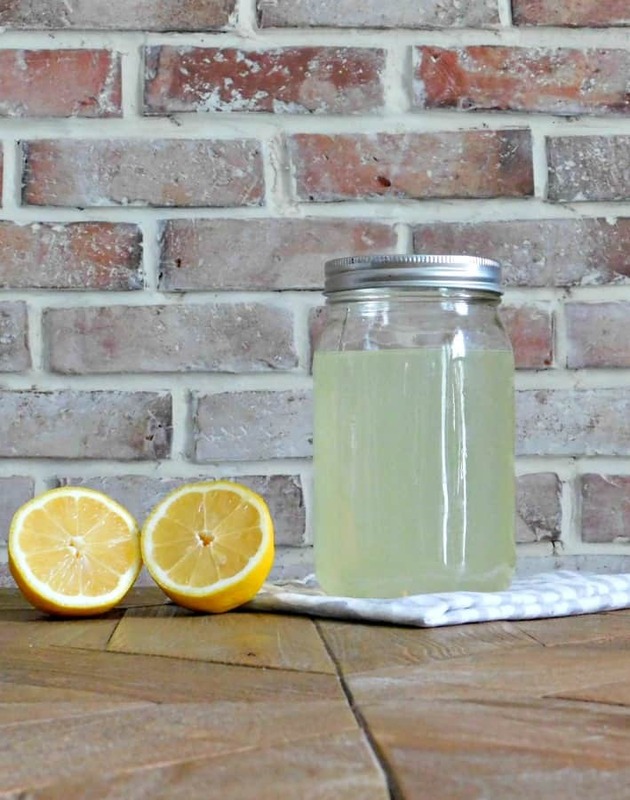 You can use juice from a fresh lemon or bottled lemon juice. You can buy a large bottle of lemon juice from the dollar store for only one dollar which is usually more economical. The lemon juice is actually an important part of this recipe, so don’t skip it. The citric acid acts as a whitener, a very mild disinfectant, and as a water softener (thus allowing stains to be lifted out more easily). Fill the rest of the jug with distilled water and use as you would bleach. Mix together and store in a large jug. I pour mine into a smaller bottles for convenience. Since the peroxide will oxidize and eventually lose strength it’s best to use the homemade bleach within a month. You need to keep this homemade bleach solution in a cool, dark place and preferably in a dark bottle. Exposure to light will make it oxidize more quickly. Keep old peroxide bottles and keep a spray nozzle from another bottle. Wrap the spray bottle in a brown paper lunch bag and secure at the top. Hydrogen peroxide can be just as corrosive as chlorine bleach, depending on its strength, and it’s more volatile at higher concentrations, yet hydrogen peroxide has been approved as an effective household disinfectant by the EPA since 1977. However, it can also be found in industrial and food grade strength, which are all above 30% dilution. This makes a much stronger cleaner, but it’s also extremely volatile at that strength. It can burn your skin severely corrode certain materials (such as vinyl countertops), tarnish metal, and explode if stored improperly. It’s best to leave this strength to the professionals and I don’t recommend it for home use. So now that you have your bleach made, how do you use it? Use 1 cup per load of laundry. For laundry you should dilute the solution for colored clothes so they don’t fade. If you do use the cleaning recipe for laundry, use only 1/4 cup and test on light colored fabrics first. Results may vary depending on the hardness of your water. How does the cost of homemade bleach compare to store-bought chlorine bleach? 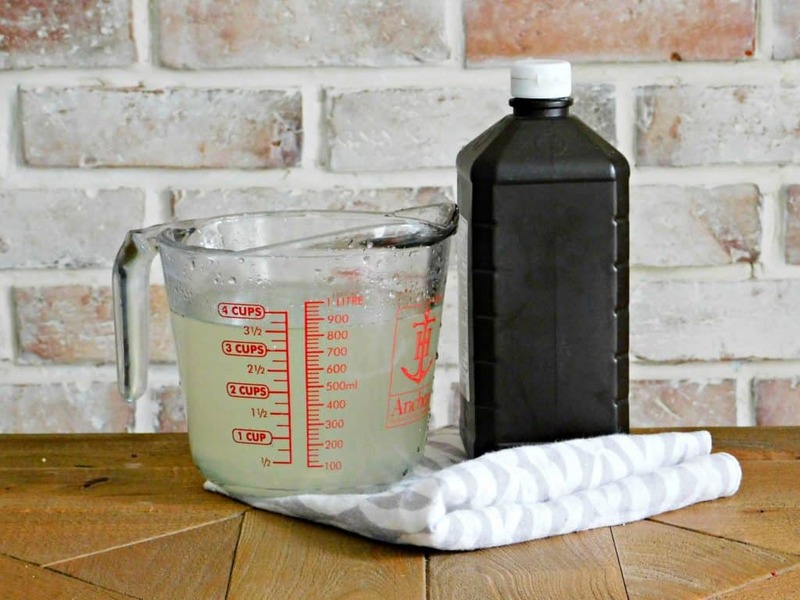 Total cost for 1/2 gallon all-natural homemade bleach alternative is just 84¢! Store-bought bleach typically costs 3¢ per ounce, but the homemade version costs just 1¢ per ounce but without the harmful chemicals. The great thing about making your own cleaning solutions is that a lot of the same ingredients like citric acid, lemon and essential oils can be used in different recipes for different kinds of cleaners. Have you ever tried making homemade bleach or other cleaning products before? Tell me about your experience in the comments! This sounds like a good one, I'll have to try it! I haven't found that this works too well…any tips or tricks? Glad I found this. Thank you for the recipe and I will be adding this to my recipe book to pass down to my daughters when they are old enough to be on their own. Hi Pam, yes, you want to use the 3% strength peroxide. I know nothing about the heavy duty stuff so proceed with caution if you go that route I would just stick the the cheapo stuff from the grocery store! happy cleaning! Is the lemon just for scent? 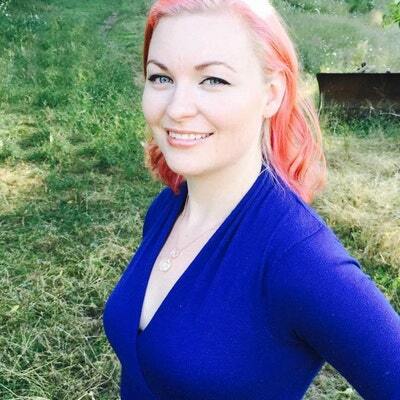 Hi Holly, I've had the same experience with regular bleach ruining a spray bottle. I haven't had this happen with the homemade bleach but I use a smaller bottle because of this and only make small batches at a time. Hi Lisa, Lemon has antibacterial properties in addition to smelling great. The main star of this cleaning recipe is the peroxide. Can't find a dark bottle? Paint the outside of a clear one, or, wrap it with duct tape. I just stole a squirt top from a generic cleaning bottle and stuck it on my dark brown hydrogen peroxide bottle and there you go! The added lemon juice would be nice though. I had no idea you could make your own bleach – thank you! I've got this linked to my household cleaners post too today, your recipe is a keeper! I just made this and it worked great for cleaning the bathroom. I'm going to try it on the kitchen sink next. Thanks for the great homemade cleaning recipe. I have to get the peroxide from the pharmacy here in Norway! Great idea, will definitely try this. I don't usually like keeping bleach in the house, but my cleaner loves it. So maybe I'll make this for her instead. Thank you so much for sharing! I have read that the peroxide actually breaks down within hours, but I never knew why. That made me skeptical about trying this. Now that I know about the dark bottle, I'll give this a try. Great idea! This is on my to do list, using the peroxide bottle to contain it all! I just wanted to let you know I featured you on Blissful and Domestic today. Holly, I checked out your recipe for the fabric softener. I am wondering if it can be used in an HE washer? If it can, that would be wonderful, and I would absolutely give it a try. Does this really work? This will certainly be amazing if it does. I got kids at home and sometimes it is so fearsome to use so many chemical products for every different area. I will really have this a try. I hope it works. I have an old ceramic sink and I haven't found any natural remedy that cleans the stains like 1/2 bleach and 1/2 water. I scrub with baking soda and other things I've read but just don't get the clean look. Any suggestions? has anyone tried this in the laundry? spray on stains or added to the cycle? i make my own laundry detergent but love to have an extra boost for the whites to keep them bright. thanks! Does anyone know if this is safe to use if you have a septic system ? 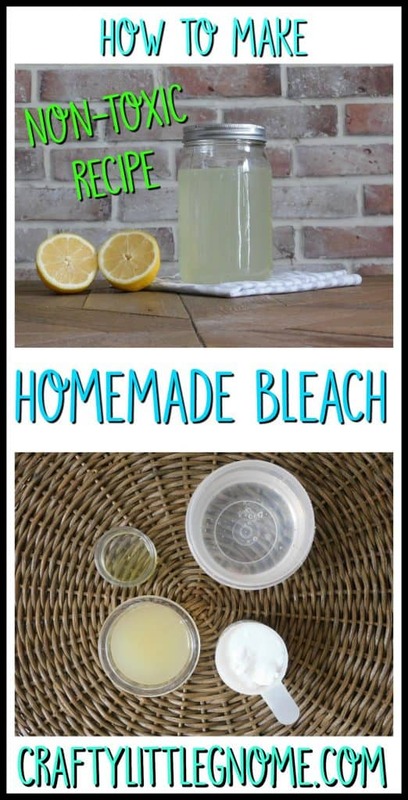 Wow, it's a easy idea for homemade bleach! I would like to make it. Could I use lemon essential oil? If so, how many drops would you recommend for your recipe? Does anyone know if it works on mold? Iwas wondering about all the home made laundry recipes can be used in my new High efficiency washer. Would hate to damage it. I haven't tried it. My washing machine is pretty old school. If anyone knows please let us know! Holly don't spray the bleach it's dangerous when inhaled. I guess it's good that it didn't work. How would it do for a bathroom that smelled like urin? Would this mixture help take that smell out ? I clean for a church and their boys bathrooms smells aweful. Or is there anything else i should do to get rid of that odor? No issues here using homemade laundry soap with an HE machine. I use the powder recipe (Fels Naptha, washing soda, and borax — and only put in 1T for a regular load) with vinegar for the fabric softener. I think the only thing you would need to be careful of is a recipe that would use regular soap in it that would create too many suds. I wash the bathroom floors with a combo of water and vinegar… seems to get the boys bathroom stink out (of course, I only have 2 boys). I also put some lavender essential oil in to make it smell really nice while I'm mopping. I also put it in a bottle for spray cleaning the exterior of the toilet. Be careful of that 30%! My dad puts it in his water (about 10 drops a day). My little girl got the 4oz bottle when she was 1 and drank the whole thing! Lucky I caught her as soon as it happened and we knew what to do. Long story short, after pumping her stomach and spending a week in Children's hospital without being able to eat or drink anything she was fine. I'm looking forward to trying this! But for the bathroom floors, or anywhere else there is tile, don't use anything acidic, it will ruin the finish. The recipe and photo have different amounts of lemon…..? I don't know if it is the same but I have a porcelain sink and the only thing I have found to whiten and remove the stains is oxy clean. Don't know if this is basically the same since they are both peroxide in different forms. Plus, I know lemon juice is a whitener also. Me either, altho all that I tried it on so far was a white shirt that had yellowish under arms stains. Now it has lots of (lighter) yellow stains all over it, as I used it liberally on the shirt, soaking it for awhile. Don't know if there's any salvaging it – stuck it in reg. bleach & it seems to be pretty good & stained. 🙁 After a couple hours I think it might be OK, but have to wait till I have better light in the morning. Can the lemon juice be the kind you buy in a bottle, ie Realemon? Or does it have to be a fresh lemon? I blended oxy clean (about one spoonful), witch hazel (about one spoonful), hydrogen peroxide (about 1/8 cup), hot water (enough for one blouse), stirred gently to blend. Soaked white blouse for a couple of hours, then left overnight. Sweat stains on collar and under arms gone 100%. Rinsed & sun drying. Two years ago, we had a major wind and rainstorm. Our 25 year-old roof leaked so badly there were water leaks from every ceiling in our house. The one in our bedroom turned black after the first day, and I noticed that the reason was, it was growing a black mold. Like Winnie the Pooh, I thought, and I thought, and I thought . . . then filled a spray bottle 1/2 and 1/2 with H2O2 and water, sprayed that extra large patch of ceiling until it was wet again (just before the “dripping stage”). The next morning, the ceiling was nearly perfectly white again and the mold was dead. It stayed dead until we could get all our repairs done. Yes. It works on mold, mildew, and every other fungus I've tried it on. I use the fels naptha, borax, and washing soda recipe too in my HE washer. Works just fine. For big loads, I use up to 2 tbsp. I have also used zote soap too which is easier to grate than fels naptha but it didn't clean as well in the armpits. I SEEN THAT RIGHT A WAY SO IS IT 2 OR 3 T LEMON JUICE? When bleaching something with regular bleach, you can leave it for days and days. I had some very old dishes with crazing, and soaked them in my laundry tub…they came out clean and I sold them on Ebay. With clothing, the same, but only a bit of bleach. Just let it soak for days. smart formula, but is the hydrogen peroxide not too strong ? Isn't? 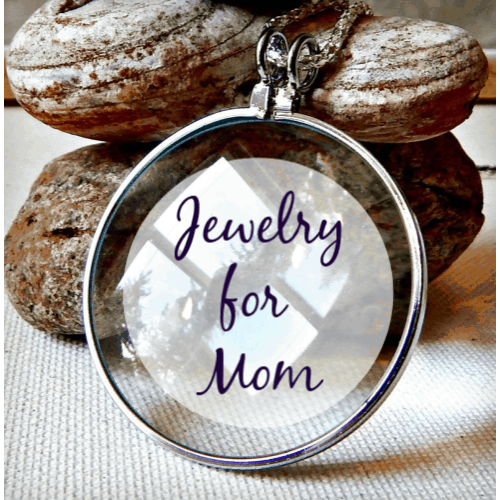 Crafty Little Gnome Jewelry Shop Now!